Walnut Wooden Shaped Tops Hangers with notches includes a gold hook. This hanger is 44cm (440mm) wide. Sold as a box of 100 hangers. 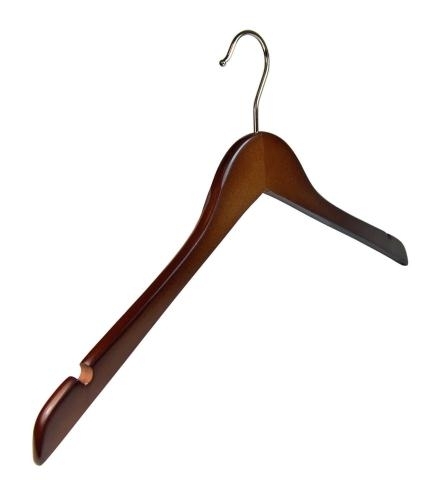 Perfect for the retail environment and sold to retailers throughout the UK and equally suited to the home the walnut wooden top hanger is ideal if you require a hanger for garments such as T-Shirts, Tops, Blouses & Shirts. This is the most versatile hanger in the walnut range. The notches sink into the shoulders mean it can also be used as a skirt hanger or to hang 2 piece outfits with top and skirt. It is wide enough to be used for mens garments, but can also accommodate ladies wear. Flat clothes hangers take up less space on the clothes rail, so this hanger is ideal for the wardrobe and the retail customer with limited space.